TWO FORMER workers from Bromsgrove’s Speeds Cycles which closed its doors in 2016 after more than a century have opened their own bicycle repair shop. 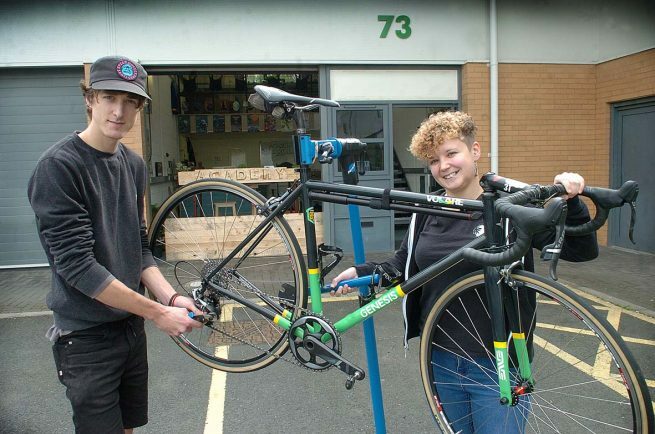 Hannah Smith and her partner Owen Hazelwood have launched Academy Bikeworks at the Basepoint Business Centre, Isidore Road. The shop is focusing on the servicing of bikes, including road bikes, single speeds, MTBs, hybrids, kids bikes and tandems. Owen, an experienced and Cytech certified bike mechanic, worked for Speeds for five years and Hannah for four when it closed. They both wanted to continue working with bikes so relocated to the North East to continue their careers in the world of cycling. Hannah worked for one of the biggest cycle parts and accessories businesses in the UK and Owen continued work as a bike mechanic. Hannah said: “It wasn’t where we both wanted to be, we wanted to be back in Bromsgrove. “We had always talked about opening our own bike repair shop but didn’t open because we did not want to be in direct competition with Speeds. Hannah said when they arrived back in the town it was case of finding the right retail premises for them to operate from. When they found the premises at Basepoint it was perfect for everything they wanted to do. “It has only been a week but we’ve already had some really positive feedback from people. “They are really happy they have a bicycle repair shop back in the town,” added Hannah. Visit https://www.facebook.com/academybikeworks/ or call 01527 903677 for more on Academy Bikeworks.